I’m reblogging this and linking to a piece I wrote a couple of years back, to underline why I really loved The Muslims by Zainab Mian. It really is a desperately needed and important book: http://theasianwriter.co.uk/2015/10/a-new-scheme-hopes-to-promote-bme-voices-in-childrens-literature/ I would love to see bookshops stocking it widely – I had to order it into Birmingham Waterstones when it should be front and centre in the shop: there is such a big audience for this book in this city! 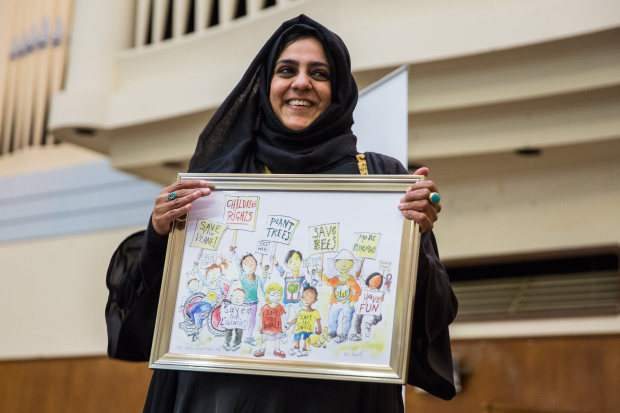 The Alliance of Radical Booksellers is delighted to announce that the winner of this year’s Little Rebels Children’s Book Award for Radical Fiction is Zanib Mian for her book, The Muslims (Sweet Apple Books 2017). The winning title is a comic-style-illustrated chapter book which explores the life of Londoner, Omar, as he navigates a new school which comes complete with its resident bully. Keen to apply Islamic teachings to the challenges he faces and armed with a fiercely hyperactive imagination, Omar’s journey is a hilarious take on life as a 9-year-old child with a proud Muslim identity in contemporary Britain. Previous Article Megaphone – making plans!